"Within the hour after getting your exercises, I was on my way to healing what ails me. I started with the 'Heart Anchor' exercise and I have felt sudden and significant results. K. C."
** Are YOU Ready to HEAL Your Life? ** Do You Want to Experience Vibrant Health? Let a "Energy Healer" Guide YOU to a Natural Way to Become Healthier! Are YOU Ready to Get Healthier? If you are feeling BAD, would you like to start FEELING better? If you are already feeling good, would you like to FEEL great? Breakthrough Chakra Healing Program Combines the BEST of Ancient and Modern Technologies to Create Vibrant Health!!! How Can Our Leading Edge Chakra Healing Program Help You? During the 6,000 years of recorded history, Chakra Cleansing-Clearing has healed countless lives! Our "Chakra Healing Program" in this "Holistic Healing Manual" can help you (as it has helped clients) to break the self defeating, unconscious physical, emotional, and mental patterns in your chakras that keep you from getting what you want out of life! How are Your Blocked Chakras Keeping You Unhealthy? All diseases, disorders, and illnesses are the results of blocked chakras! Most people have "blocked" chakras... because they are constantly exposed to toxins (pollution, germs, contaminants, etc) in the environment. These toxins plus the non-stop stress of daily living in our "hurry-up-keep-up" world act to block the chakras! If you have any or all of the following conditions, you have blocked chakras! * Blocked chakras create obesity and constant food cravings (sugar, chocolate, etc). * Blocked chakras result in low energy, chronic fatigue, and constant dehydration. * Blocked chakras cause depression, anxiety, stress, fearfulness, and forgetfulness. * Blocked chakras lead to runaway, negative "uncontrollable" emotional responses. How Does Cleansing & Clearing Your Chakras Promote Vibrant Health? All health, healing, and wellness are the results of open and flowing chakras! Vibrant chakras... allow the body to easily dissolve environmental toxins and to handle the stress of daily living by strengthening the overall energy field! Imagine how wonderful life can be for you with open, vibrant chakras! * Vibrant chakras make weight loss much easier to achieve and maintain. * Vibrant chakras result in high energy, great stamina, and well being. * Vibrant chakras create greater mental clarity and emotional harmony. * Vibrant chakras support lasting physical, mental, and emotional health. How Will this Chakra Healing Program Make You Feel? "When I first found Ellen, I was sent to her. I was suffering terribly with pain in my stomach, and violent constant headaches. Over time, and with great united effort, we were able to release me from my past (lives) torture." 'Let go, and let your true self emerge from the ashes of past lives lived'. God bless you in your mission. Sincerely, W. L."
Quite literally the effect from this "Chakra Healing Program" is something that needs to be experienced to be believed. If you are like most, while you are on the program, you will feel relaxed, peaceful, and more in tune with the rhythms of your body, mind, and emotions. As you continue with the program, these pleasant feelings will increase as you empower your	body, mind, and emotions to heal themselves naturally and harmoniously. This "Chakra Healing Program" will help you to open more fully to the universal love energy which is just waiting to lead you to greater joy and fulfillment! How is this Chakra Healing Different from Other "Similar" Programs? * Clearing Chakras: means flowing energy through chakras easily,	regularly, and in the proper amount so that the physical matter will not deteriorate. Clearing chakras is the only step traditional chakra programs include: it only deals with symptoms. * Healing Chakras: means taking active steps to resolve the issues that caused the blockage. You can clear your chakras over and over again but if you do not deal with the onslaught of "life junk" rushing toward them, they just get clogged again. Healing deals with the problem by healing the hurts that are running your life. * Balancing Chakras: means regulating the flow of energy into the healed chakras so that it is harmoniously integrated into your being... so that you feel great! * Aligning Chakras: means having balanced chakras working together in perfect harmony so that you experience vibrant physical, mental, and emotional health. Clearing and healing are about removing problems to become well. Balancing and aligning are about maintaining your state of wellness once it is achieved. The ultimate goal of "Chakra Cleansing" - clearing, healing, balancing, aligning - is to keep all your chakras fully functioning for	vibrant health. Best of all, this program takes the cleansing (clearing, healing, balancing, and aligning) of your chakras to your inner energy bodies. That is what gives our "Chakra Healing Program" it's unmatched power and what makes it truly one-of-a-kind! 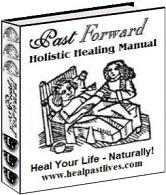 What is Included in Past Forward's "Holistic Healing Manual"? Our "Holistic Healing Manual" consists of four mini-manuals: for the complete Table of Contents showing just what you will get in this manual, click here. * The revolutionary, breakthrough "Chakra Healing Program" (described above). * How to identify and focus on healing your problem chakras for vibrant health. * How to customize your healing process so you can achieve results quickly. * How to flow the natural healing directly to all your inner energy bodies. "I've been working intensively on myself for six months. I've cured physical problems ranging from the reversal of diabetes to a sore throat. Ellen helped me channel answers and guide me through the exercises I needed to do at each stage of my awakening. T. R."
This chakra healing program is exclusively from Past Forward and is ONLY found in this eBook! This program has been used successfully for years by 1,000s of clients to heal their lives now. If you follow this advanced "Chakra Healing Program", you will heal your life! * Experience the power of crystals to gently heal and energize your chakras! * Use the power of toning mantras to accelerate your healing naturally! * Unleash the hidden healing power of your limbic brain with aromatherapy! * Use herbal cures to boost your body's natural self healing abilities! * Use hand and foot reflexology to touch your way to better health! "Ellen is by far the most powerful, accurate healer. Her one-on-one sessions are life altering! Please heed her advice to rest and pace oneself after doing the exercises (the same as those in the manual) - they are that powerful. A. D."
This outer cures program is exclusively from Past Forward and is ONLY found in this eBook! This program has been used successfully for years by 1,000s of clients to heal their lives now. If you use the outer cures with the inner healing of your chakras, you will heal your life sooner! * Exercises for understanding why you are where you are today! * Exercises for healing your "Self" to achieve harmony and wholeness! * Exercises for healing relationships between your "Self" and others! * Exercises for expanding your awareness to claim your divinity! * Exercises for improving your mastery over life! "I wanted to share my experience with your exercises. I have to admit, I was a bit skeptical at first, only because I've tried similar approaches with mixed results. After doing two of them, it's made a believer out of me... I was	totally blown away. C. D."
If you are ready to become your Higher Self, these exercises will get you to wherever	you want to be, to do, or to go today! * Basic Exercises for healing and integrating your past lives! * Advanced Exercises for healing and integrating your past lives! * Exercises for exploring your past lives by journeying through time! "Dear Ellen, I have had two more past lives present themselves spontaneously through using the clustering (exercise). Until now, I have had little ability to recover my past lives and, particularly, to see how they are effecting my current life. J. M."
If your problem does come from past lives... it can be remarkably resistant to present life cures. To heal the past, you need to go back to the past and heal the effects on your life now. These exercises will help you to heal your past lives to empower your present and your future! Remember when you ARE good on the INSIDE, you will FEEL good on the outside ("as above, so below"). This "Holistic Healing Manual" can help you to be your best... if only you will give it a try... all you have to lose are your problems! FREE BONUSES: Yours to keep for trying this "Holistic Healing" eBook! Bonus #2: (Value $12) "Rules of the House" If you want to attract more health then discover how to become more attractive to it with the rules for living a karma free life! Get more health by becoming more love! After you order this "Holistic Healing Manual", you will immediately qualify to receive our "Chakra Healing CD" for $9 with FREE shipping (a 50% savings) because it is the perfect companion to this manual and you deserve it	for being so committed to your healing process! Just Email me at ellen@healpastlives.com to take advantage of this offer! After you order this "Holistic Healing Manual", you will immediately qualify to receive our "Mantra Card" for $3 with FREE shipping (a 40% savings) because it is the perfect companion to this manual and you deserve it	for being so committed to your healing process! Just Email me at ellen@healpastlives.com to take advantage of this offer! My G U A R A N T E E for this "Holistic Healing Manual" eBook! 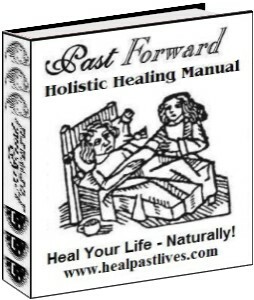 I have used this "Holistic Healing Manual" in my healing work every day for many years. This "Holistic Healing Manual" is an Owner's Manual for Your Body, Mind, Emotions, and Spirit to help you on the road of life! It is my sincere hope that this manual will make your personal journey along the long and winding road of the universe a safe and successful one.